By the time a baby has reached 6 months old or 26 weeks breast or formula milk is no longer sufficient on its own to meet their nutritional needs and they will need to be introduced to solid food. The term which is generally used for this is 'weaning'. Important: Weaning should not be introduced too early. Paediatricians, nutritionists, and child specialists now advise that weaning should not begin until a baby is at least 6 months old as under this age their digestive systems are not mature enough to process the food. It has even been suggested that weaning under 6 months of age may lead to digestive/stomach problems and allergies and intolerances for some babies. The way in which a baby is introduced to solid foods will vary according to the way weaning in undertaken and the preferences of each baby. 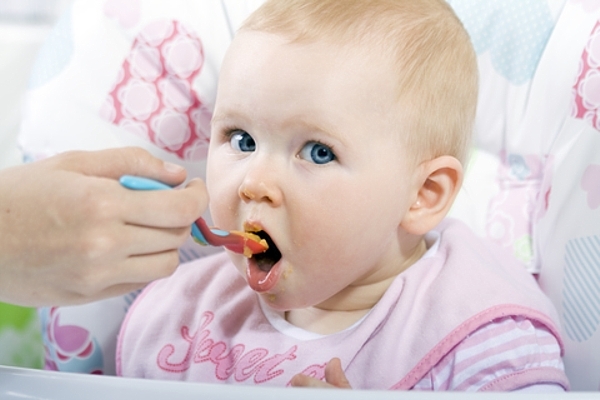 How do you know when a baby is ready to wean onto solid food? • Not feel as full as they did after milk feeds, may cry for more or start waking at night with hunger. • They can sit up well without support. • Have some fine motor skills to pick up food if BLW. • Show interest in food and meal times and may try to grab food from others. Once a baby is ready to wean, parents or carers must decide in which way they want to wean. Once your baby begins the weaning process they should be offered cooled boiled water in a weaning beaker with every meal. Stage 1 Babies will continue to have milk feeds (breast or formula) and will try a very small amount of food on a weaning spoon, or finger foods if BLW, until they have developed a taste for solid foods and have had experience of chewing, swallowing, and developing the ability to manage foods, whether this be purees or finger foods. This stage lasts approximately 2-5 weeks. Stage 2 Once a baby has accepted and developed the idea of food, and the ability and skill to eat solids, the amount of solid foods offered should be increased and the amount of milk decreased. Foods should take on more of a meal role, replacing milk feeds gradually. A variety of foods should be offered. If providing purees, the consistency should move on from a smooth puree to a lumpy version. This stage lasts approximately 2 months (baby aged 7-9 months). Stage 3 This is the final stage of weaning. Babies (now aged 9-12 months) should be competent eaters and be able to manage most foods with ease. They should be beginning to develop tastes and preferences for certain foods. They should now be having three good size meals a day and begin to have routine meal times that can be set around family meals to develop good eating habits, socialisation, and family time by eating together. By the time babies reaches 12 months of age they should only be having 2/3 milk feeds a day: once in the morning on waking and once at night before bed; or 3 smaller milk feeds, one upon waking, one mid afternoon, and one before bed at night. They should also be working towards moving from formula or breast milk to cows milk between 12-15 months. A baby should now be competent in eating most foods, and meals should no longer need to be pureed or mashed, just cut up into manageable sizes. A baby should also be eating finger foods well.